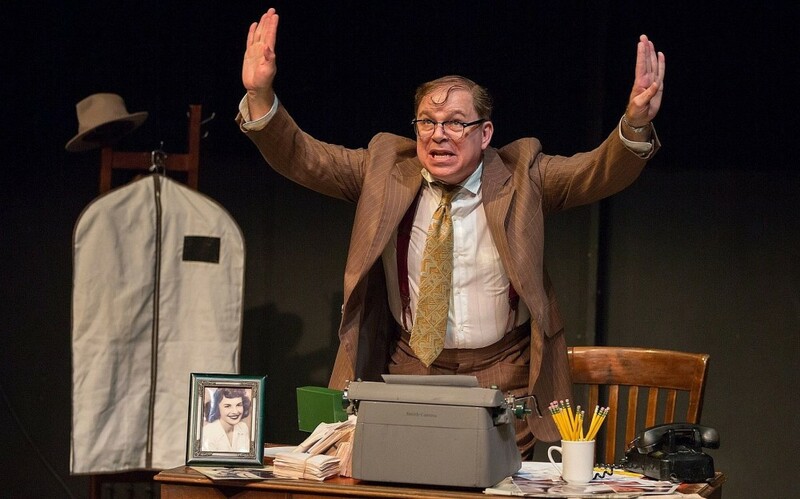 There are a lot of Jewish jokes in A Jewish Joke, Marni Freedman and Phil Johnson’s not-up-to-expectations solo play, in which Johnson portrays a comedy screenwriter suspected by the FBI in 1950 of subversive associations. Now at Theatre Row’s Lion Theatre, the production won a United Solo Best Drama award and has had a number of previous showings elsewhere over the past few years. 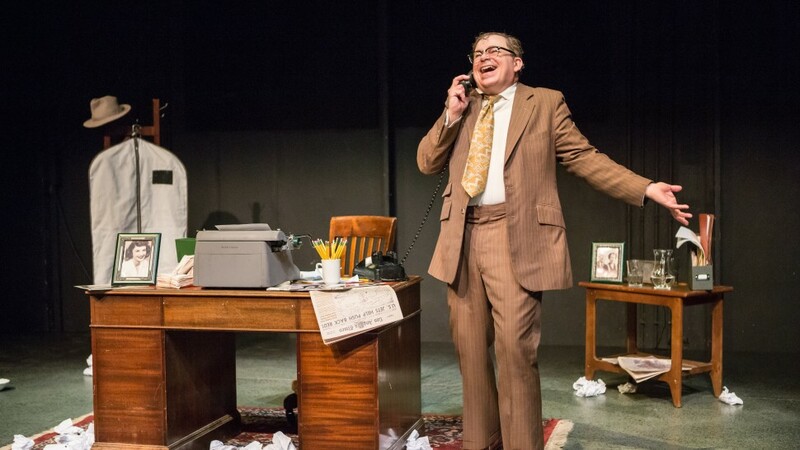 Aside from the fact that few of the many jokes land, the play, swiftly staged by David Ellenstein, is actually a serious one about the communist witch hunt or Red Scare that infected America in the postwar years. That’s when people (those in the movie industry being favorite targets) were in danger of losing their livelihoods and being sent to prison for their politics: think Hollywood Ten. In other words, expect something more like The Front and less like Old Jews Telling Jokes. Just not as good. Johnson plays Bernie Lutz, a fictional character inspired by an uncle of the actor’s husband whose wisecracks reflected the Jewish humor of mid-century Borscht Belt comics. We spend 90 minutes in the company of this crusty, middle-aged schlub with his sloppy combover and brown, crumpled suit and tie (costume by Jordan Smiley and Peter Herman), watching him sit at or circle the cluttered desk in his MGM bungalow. Dangling from it are scripts for the Marx Brothers, NBC, and Danny Kaye. Bernie’s excited about the evening’s premiere of his and his partner’s new movie, The Big Casbah. He’s ultra-busy on the phone with his wife and secretary making sure everything goes smoothly. But that overused phone (whose frequent rings, for some reason, have been muffled by sound designer Matt Lescault-Wood) also tells Bernie that he and Morris Frumsky, his partner and childhood friend from Newark, are in hot water. They’ve been outed as likely pinkos by Red Channels for having attended a communist function. Bernie insists he was an innocent bystander. Morris? Maybe not so innocent. Bernie is one of those irrepressible jokesters who can’t help himself from making would-be funny asides whenever he opens his mouth. He even takes a moment for a nutshell explanation—debatable—of Jewish humor. Naturally, Yiddish words abound. Kishkas, farkakte, schlemiel, putz, meshugganah, and others in the lexicon comprise the coating of an everything bagel without enough comic shmear. Judging by the polite but barely audible chuckles the night I went, few of his gags zinged funny bones as sharply as did the standard Jewish jokes he often stopped the plot (for unclear reasons) to read off index cards, like mantras. Take, for example, Ben Hecht’s: “Why aren’t Jewish Mothers attacked by sharks? Professional respect.” I recognized another from Leo Rosten’s The Joys of Yiddish, where the word “schmuck” is connected to someone on a camel. Johnson gets only a mild smile here from what should be a roar. A Jewish Joke is a crowded, unsubtle piece, jammed with annoyingly incessant, desperate phone business, including frustrated banging of the receiver (remember those?). Requests for outside calls get instantaneous responses and there’s nary a busy signal in Bernie’s universe. Extraneous issues, like a thread about an incident allegedly involving Bernie’s father, further clutter the narrative. I could have sworn that Johnson, who works his tuchas off, pronounced that word “tukas.” Even if I misheard, it would have been only one way in which he betrays his Windy City accent. With A’s as flat as his comic punch, he sounds like anything but a kid from Newark. This should be tour-de-force territory, and Johnson’s intensely strenuous efforts are likely to be appreciated as such by some. For my gelt, however, he lacks the innately East Coast tone of, let’s say, a Jackie Mason or a Mel Brooks, although faintly shadowing their aggressive mannerisms. Plays about the communist witch hunts are fairly common, including examples by Miller, Bentley, Busch, and Kushner, each more enlightening than A Jewish Joke. Still, imperfect as this play is, it’s impossible to deny its resonant depiction of Bernie’s moral crisis, so similar to what actual persons faced. And that’s no joke.